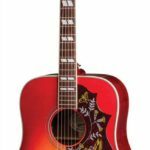 Gibson’s Epiphone guitar line offers a remarkable high-quality budget acoustic guitar that looks and performs great, but doesn’t have an astronomical price. 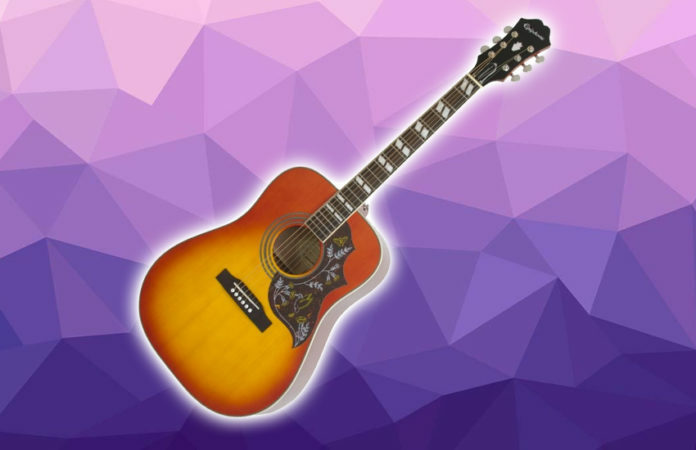 The Hummingbird has a solid spruce top, mahogany neck and sides, and a rosewood fretboard and bridge. Considering the price, the woods used in Hummingbird Pro aren’t as high quality as on the Gibson guitars. 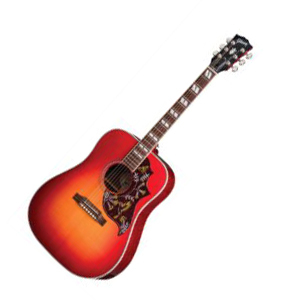 The Epiphone hummingbird pro looks amazing with the cherry sunburst color, with the reds and yellow colors sprayed on the top of the guitar. Even though it looks pretty similar to the Gibson guitar, we can still notice that the colors on the Hummingbird are less rich. The Hummingbird Pro’s sound is bright and balanced with good intonation. It’s low ends are also great for some light rock riffing. The action of the nut is nice and low, but what i didn’t really like about it is that at the top of the guitar, where the neck is connected to the body, it loses a bit of power, and that makes it a bit harder to play leads when compared to other acoustic guitars. In my opinion, this guitar is not suitable for beginners, because it might need tuning and a good setup before you can start playing it. As i mentioned earlier, this guitar is very similar to the Gibson, but there are some differences which we noticed. One of the main ones is that Gibson’s neck is 1.72 inches wide. The Hummingbird Pro’s neck is a bit narrower at 1.68 inches. The Gibson has real pearl inlays, but the Hummingbird uses plastic imitations. When you plug it in, you will notice that this guitar comes to life. When it’s plugged in, everything about it will sound better. The bright tones will be pretty bright, the sound will sound better and it will overall do everything better than when unplugged. The controls of this guitar are very easy to access and adjust. You can adjust the bass, the treble, the volume and you can also completely mute it. It is also possible to change the dynamics. That should be a good enough indication that it is indeed a well-made guitar. To conclude, I would say that this guitar is not a suitable guitar for beginners since it has too many features which might confuse beginner players. That being said, if you are an intermediate or a professional guitar player that has mastered acoustic guitars, you can grab the Epiphone Hummingbird Pro and taste the benefits of an acoustic-electric guitar. As i mentioned earlier, the hummingbird pro can be considered as a budget version of some Gibson guitars. With Gibson, you always get quality and this is the same with Epiphone guitars.